The President of the Grenada National Organisation of Women (GNOW) believes that women have an important role to play in the implementation of any strategy aimed at reducing the high level of food that is imported into the country for domestic consumption. “What goes into that pot has a lot to do with women. They can help the economy be using substitutes. Women control the kitchen, and what goes into that pot for the family is a decision she makes and as you know women are mainly responsible for what the family eats,” said Gloria Payne-Banfield during her first news briefing following her election as President of GNOW on 13 September. “Breadfruit can easily be a replacement for imported potatoes, and when this is out of season other vegetables can replace that. Women can stop the hemorrhaging of our foreign exchange just by making some small and simply changes to the pot,” she said. Surrounding by some of her executive members, Payne-Banfield said that her intention is not to violate the rights of persons by telling them what to eat, but at the same time persons need to know that the action they take can change the situation in the country. 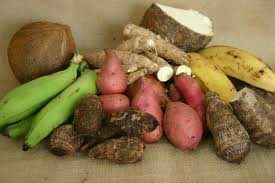 “A lot of what we import can easily be substituted by locally grown products, breadfruit vs potato is one example. Our juices, jams and jellies are other examples. A lot of these things are imported but we have local products which make good replacements, and that is why I say women can change the economy outlook,” she said. Referring to the work undertaken by the Homemakers Association which is a member of GNOW, Payne-Banfield said that over the years the members have come up with ways in which local produce can be used, and if only consumers will use the booklet, a big difference will have in the home and the economy. Data from the Ministry of Finance indicates that for many years now the food import bill continues to grow into the millions. Many reasons have being given for the continuous growth but it is a combination of many causes and effects. There are some who believes it is because consumers have acquired a taste and appetite for the imported food, while some believe it is because of the final cost for local vs imported products.